Recent rains throughout the Western states supplied by Lake Mead might give the impression that a more than decade-long drought affecting the Colorado River is over. The numbers below, along with modeled projections from the federal Bureau of Reclamation for 2010, show just how false those impressions might be. While 2010 has been declared a normal water delivery year by Reclamation, the “most probable” scenario in its model shows the elevation of the largest reservoir in North America dipping near 1,075 feet next autumn. This is the elevation at which under a seven-state Colorado River agreement mandatory shortages kick in and Arizona and Nevada can be expected to take hits in their allocations, with the most punishing affecting Arizona. In a cruel stroke as conservation becomes a life or death question for the Southwest, the most wasteful of the states to varying degrees dependent on Lake Mead, California, will be unaffected by the first round of cuts under the shortage sharing agreement because of priority rights dating back to the Gold Rush. In Las Vegas, Southern Nevada Water Authority general manager Patricia Mulroy has said that when Mead reaches 1,075 her board will have no choice but to authorize construction of a nearly 300-mile-long pipeline planned to run north into the Great Basin to tap groundwater of rural valleys. Protestors from those valleys have recently won a series of cases invalidating claims by Las Vegas to that water (click here and here for those October 2009 and January 2010 decisions). However, those cases are either under appeal or have been referred to a district court for further analysis. Meanwhile, an environmental impact statement being overseen by the Bureau of Land Management is expected to be published in April. 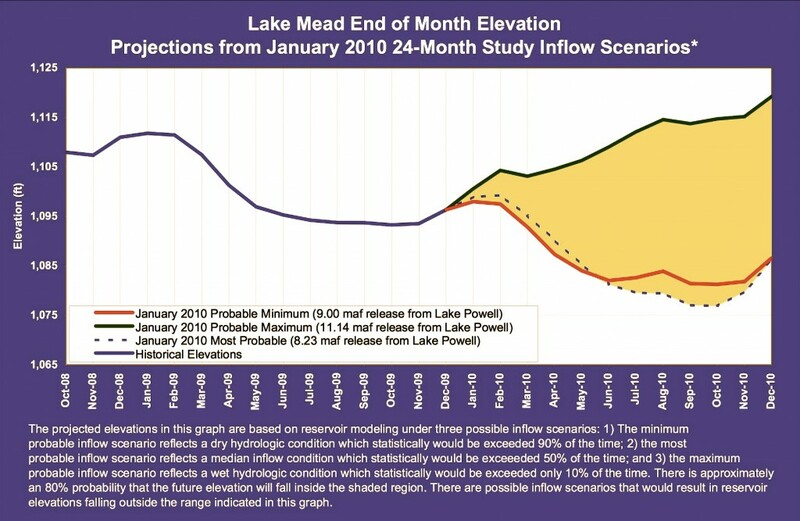 Below are contrasting figures for closing January elevations for Lake Mead going back a decade. For Reclamation’s records going back to the completion of Hoover Dam, click here. Correction: An earlier version of this post indicated that deliveries to Mexico would be affected by the shortage sharing agreement. This was incorrect. Only Arizona and Nevada will be affected.